Orthodontic treatment encompasses much more than just traditional braces – there are many different options to straighten your teeth, such as lingual braces, or Invisalign. 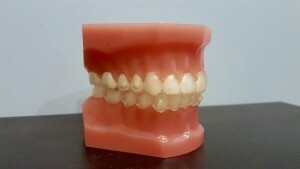 Here at Bethesda Dental Specialties, we uniquely offer Invisalign for patients of all ages! When children reach age 7, they may benefit from an orthodontic consultation and Early Phase orthodontic treatment. First, we do a digital scan of your teeth, allowing us to create your treatment plan. Dr. Hickory takes each and every individual case and carefully makes your orthodontic treatment on software from Invisalign, and sends it to a lab to create your aligners. This treatment plan shows every micro-movement that your teeth undergo as well as the final results at the end of your treatment. Each shift is a precise movement that better positions your teeth to be perfectly straight! Unlike braces, which are directly bonded to your teeth, the Invisalign process involves wearing a series of clear plastic aligners, custom-created for your teeth and treatment. Dependent on your tooth movement, you wear an aligner for 7 to 14 days before moving onto a subsequent one. Each aligner has been uniquely customized for micro-movements of your teeth, resulting in a beautiful, straight smile! Flexibility – Patients are generally advised to avoid crunchy or sticky foods while undergoing orthodontic treatment in traditional braces, however, the ability to remove your trays (aligners) with Invisalign allows more freedom to eat different foods. Just remember to brush your teeth before putting your aligners back on! Easy removal – While you should wear your aligners for at least 20-22 hours a day, if you have a special event to attend and do not want to wear your aligners, you can easily remove your Invisalign for a few hours! Comfort – Custom-made trays yield to aligners that fit easily and well. Traditional braces have been known to be uncomfortable at times due to poking wires. Less orthodontic visits – We love seeing you, but we also know that you are busy! Opting for Invisalign means fewer check-ups at the office (we typically see our patients every 3 months to check-up)! Better oral health and hygiene – It can be a little hard to floss and brush around traditional braces, but the removal of your aligners allows you to take care of your oral health as you normally would. Invisalign is easy and effective! We have had patients of all ages, from kiddos to seniors. Check out what our patients have had to say here. Dr. Hickory is a pioneer in Invisalign. He was one of the first orthodontists to use Invisalign and has treated over 5,000 patients using its innovative technology. To attest to his experience and expertise, Align Technology, the company behind Invisalign, has designated him to be a Top 1% Invisalign Provider. When he is not in the office and treating his own patients, Dr. Hickory often goes to teach classes and seminars to other doctors on this technique.